The correct tree trimming tools and equipment are essential but often bulky when trying to work safely at height. 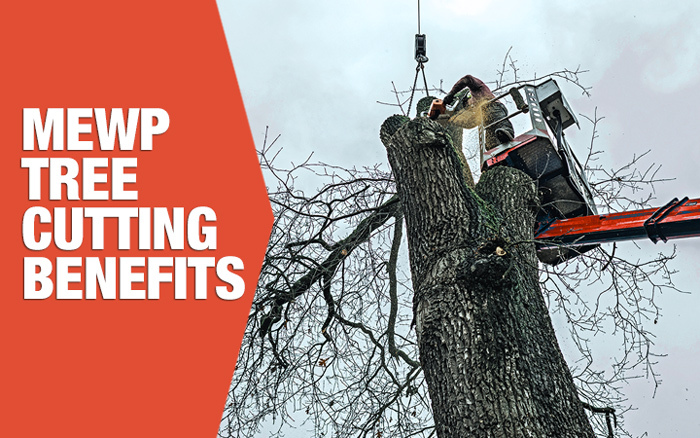 To get people, tools and equipment to the correct height there are times when traditional working solutions can limit productivity and endanger the arborist. Powered access platforms offer a flexible way to reach jobs at height – they are fully mobile and can access areas with restricted space, improve site safety, and save money. Spider lift access platforms have the advantage of being transported, set up and utilised quickly and easily with flexibility, depending on the demands of the job. Spider lift access platforms are lightweight with low ground pressure, especially advantageous when working near garden pathways and manicured lawns. Placing the MEWP carefully and raising the platform allows the operator to get a close view of potential tree cutting problems that are not always seen from the ground. Identification of dangerous branches and potential fall areas for cut wood will help reduce the risk of accidents. Tools can be safely taken to where they are needed without the risk of hauling up by rope. With no arduous climbing to the crown and working from a stable platform, the arborist can get a good view of the work that needs to be done without putting themselves and others in a hazardous situation. Familiarisation with the powered access equipment manual is essential reading along with a pre-work risk assessment. Training in the use of access equipment is required by law and will benefit businesses as the equipment can be used safely, quickly and efficiently by a small number of staff. Reducing the time needed to manually climb and haul tools up into the tree can reduce the time needed for individual jobs. More jobs done in a week will help raise productivity and profit. In addition the reduction of time needed at the location can mean less obstruction and inconvenience to others. Using a powered access platform when providing a tree surgeon service enables the optimum tools to be used when working on the tree. Working efficiently and effectivity will raise the quality of work done leading to higher customer satisfaction and recommendation of your tree services. Whether you are looking to buy or hire the equipment for arboreal work, powered access platforms, are mobile, safe and flexible. They resolve a number of issues posed by traditional rope climbing and lifting methods including access to hard to reach and potentially hazardous areas. With the correct procedures in place, health and safety risks are reduced whilst jobs can be completed in less time. Whatever the size and location of your job, they are easy to operate and install, safe to use and can cater for a range of needs and requirements to enhance your tree services. Promax Access provides advice in choosing from their range of Spider Lift Access Platforms ideally suited to your tree surgeon’s business.